Michel de Montaigne was not your typical philosopher. A deep thinker, yes – but a man who wasn’t afraid to be funny and philosophical at the same time. Everything in life was grist to his mill, from fatherhood to flatulence, cowardice to cannibals, Socrates to smells. 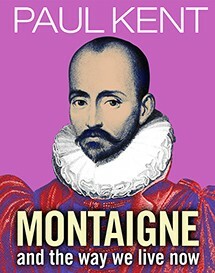 While ranging over many of the infuriating elements of contemporary life, Paul Kent also gently introduces us to Montaigne the man: whether poking into the dubious entrails of celebrity autobiography or wondering how much alcohol is just the right amount of booze, musing on the fine line between intelligence and stupidity, scratching his head over the attraction of free-form jazz, or despairing of the standards of modern footballers, Paul Kent leads us on a merry philosophical dance to the heart of The Way We Live Now. Paul Kent is a Londoner by birth and inclination. His childhood was spent in Blackpool, where he was educated, before gaining a place at St. Catherine’s College Oxford to read English, and later American literature. He did not quite complete his doctoral thesis, being lured away by the BBC a few weeks prior to submission. He stayed with the Corporation for 12 years, as Producer and Commissioning Editor with the World Service and Radio 4. As Programme Director of Oneword Radio, he steered the digital station to two Sony Gold awards, then gave it all up to travel the world. He currently earns his crust as a freelance writer, script editor and radio producer.